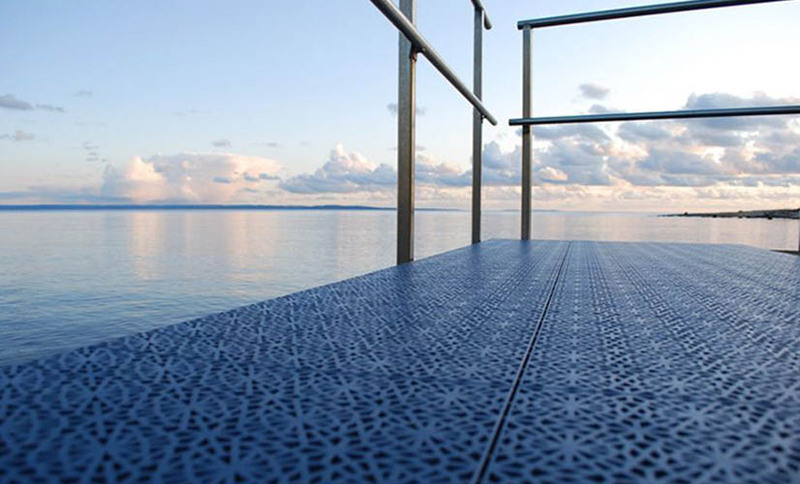 The plastic tiles from Bergo (Sweden) offer lots of benefits. Very resistant, easy to install, they can be used outdoor as they can stand extreme temperatures, water and the sun light without being harmed. bergo brings together performance, comfort and security for the users reducing their injuries and increasing their sensations. They offer an excellent drainage in places where walking safe is a must. They are hygienic and easy to maintain. A wide color range, different designs and sizes allow the creation of cozy and attractive atmospheres. Available in several colors, allowing to create attractive atmospheres. The XL tiles come in 38x38cm and 10mm thickness. They belong to the system 2 category. A smart expansion system is included within the tile, so there is no need for the expansion strips. The Unique range offers a touch of difference and allows the creation of modern atmospheres. To get a perfect finish, Bergo offers access ramps and angles that will prevent from falling. They allow the floor to expand and contract when the tiles are under big temperature changes (especially outdoor but also saunas). They are necessary for System 1 (Royal, Premium). Bergo came up with simple but Smart tolos to dismount one tile or the entire floor. The installation of the Bergo tile is easy and fast. You just need a hammer and a jigsaw to cut. The Bergo tiles are not porous, they kill the germs so they are very hygienic. Besides, the maintenance is very easy with a vacuum cleaner and water and soap.